Finding joy in variety, Liz Pearse is a musician of many pursuits. Liz began her exploration of the endless possibilities of the voice after a childhood spent playing any instrument she could lay hands upon. As a performer, her uniquely colorful and versatile voice has led to performances of wide-ranging works from medieval to modern, and though she is known as a specialist in contemporary vocal repertoire, she also deeply enjoys a well-aged song. Liz has recently begun a long-term project commissioning and performing works for singer at the piano (though she still enjoys the collaborative process! ), and presents her second full-length program of such pieces, a celebration of the 100th anniversary of Poulenc’s La bestiaire featuring newly-commissioned animal portraits, on tour in 2019. 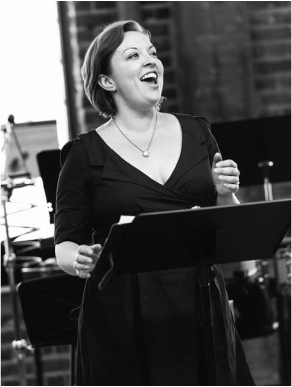 Liz is one-fourth of Quince Ensemble, a treble-voice quartet dedicated to "charting bold new directions in vocal chamber music" (John von Rhein, Chicago Tribune). Their third album, Motherland, was released to critical acclaim by New Focus Recordings in spring 2018, and they head back to the studio to record love fail summer 2019. Liz has a special affinity for music post-1900. As a soloist, her performances include multiple performances of Pierrot lunaire, touring Olivier Messiaen’s Harawi, electroacoustic programming including Philomel, and on-going commissions dedicated to the creation of works for self-accompanying soprano. In addition, Liz forms one-quarter of Quince Ensemble, a treble quartet dedicated to the creation and performance of contemporary vocal literature. With Quince, Liz has performed on tours of Morton Feldman’s Three Voices, David Lang’s love fail (including the work’s Polish premiere), and on numerous collegiate residencies and festivals from coast to coast. Quince’s third album, Motherland, was released to critical acclaim by New Focus Records in April 2018, and they head back to the studio to record love fail in 2019. Liz's doctoral recitals included Messiaen's Harawi and an electroacoustic program, among a diverse range of art song and chamber music performances. She also won both the Dr. Marjorie Conrad Art Song Competition and the BGSU Competitions in Music concerto competition while at BGSU, and her mentor there was Dr. Jane Schoonmaker Rodgers. Prior to her doctoral work, Liz studied with Patricia Stiles at Indiana University. ​More information about Liz can be found at lizpearse.com.